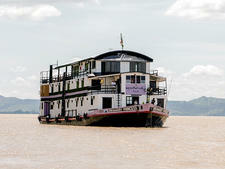 The largest of four ships owned by Tint Tint Myanmar, the Makara Queen is a luxurious four-deck ship that sails on the Irrawaddy and its tributaries in Myanmar (Burma). Carrying a maximum of 50 passengers and staffed by a crew of 30, the vessel offers high levels of personal service. The air-conditioned cabins, all with private balconies and floor-to-ceiling windows, have a bathroom and shower, slippers and robes, hair dryer, satellite TV, telephone, safe, complimentary bottled water and mini-bar. The 22 deluxe cabins measure 280 square feet and can be configured as a double or twins. The pair of suites, both measuring 390 square feet and with king-sized beds, have two balconies and additional perks including L'Occitane toiletries and a fruit basket on arrival. The suites are individually decorated with traditional handicrafts and sculptures. Meals feature a mix of traditional Burman cuisine and gourmet Western dishes, and the chefs use fresh, locally sourced and organic ingredients. Special diets, including vegetarian, can be catered for. Days begin with tea and coffee for early risers, and these beverages are complimentary throughout the day. A buffet is served at lunch and dinner is a la carte. The drinks menu includes premium spirits and quality wines. On each cruise, the chef hosts an onboard cooking lesson, showing guests how to prepare two of Myanmar's most popular dishes: lahpet thoke (green tea leaf salad) and gin thoke (ginger salad). Onboard amenities include a pool, cinema room and spa with two treatment rooms. The signature treatment is a healing massage that combines traditional techniques from Thailand, India and China. There is also a currency exchange and shop selling local souvenirs and other items. 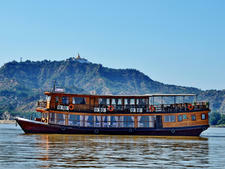 The Makara Queen cruises on three- to six-night itineraries, with the longest cruises sailing from Mandalay to Bagan and back. 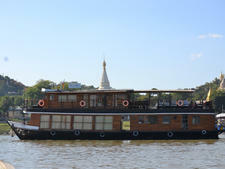 It also sails on the Chindwin River on a charter-only basis.